not a flaw in your character. Although it might be a lifelong struggle but believe me, you are not powerless. All that is required is the belief that you can, and will cope up. With good symptom management one can experience long periods of wellness. Most people don’t notice their moods, they believe whatever they are thinking is reasonable at the time, even though it can easily be coloured by their mood. It’s easy for a stressed-out person to think of more reasons to be stressed about; an angry person will tend to overreact to the slightest annoyance; a sad person will fail to notice reasons for joy. This is not particularly harmful most of the time for most people: their emotions stay within a manageable range – not too high, not too low. But for people with a mood disorder, however, this can be lethal. It’s very important to keep a check on the behavioural triggers like stress, arguments with loved ones, problems at work or school, seasonal changes and lack of sleep. When you start getting frustrated by minor things it is a warning sign. Go and meditate, try to relax, and most of all hang onto the understanding that the world is not that bad, the mood was temporary, and this too would pass. The interesting thing about meditation is that as you still the mind it is like clearing grime from a lens. You begin to see light. I liken it to a messy desk. Each day the desk gets more orderly, piles of papers get gone through, things trashed, things filed, things considered. It’s a transition from turbulence to stillness. It’s very essential to keep a watch for any subtle changes in your sleeping pattern, in your moods, energy levels and thoughts and compensate for your moods. There would typically be a few days of high energy, being happier than usual, and plunging into work head-on for hours at a stretch. In case you learn to recognize as to when do you start getting into a “high” phase”, you may be able to “cool your jets” by relaxing, meditating, etc. If you catch it early you may be able to nip it in the bud and prevent a minor mood change from turning into a full blown episode of mania or depression! Awareness about your illness is a must. Learn all you can about it as it allows you to make informed decisions about your treatment, take action to keep you moods stabilized , thus making your life, the life you want for yourself. I’m not an expert on Bipolar Disorder but I feel that open communication with the therapist or your doctor and being honest about your symptoms would really help as the treatment program will change over time. DON‘T SAY FINE if you are not fine. Tell them everything in EXCRUCIATING detail. 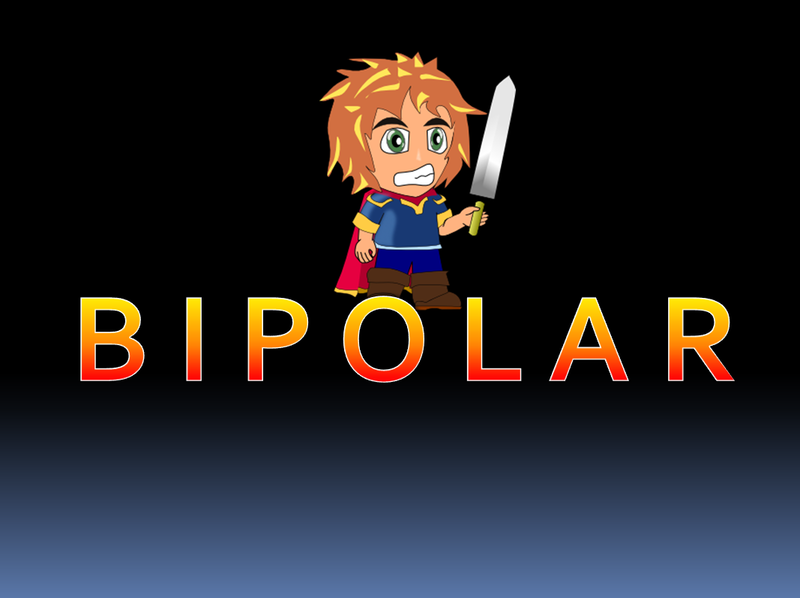 Another interesting question is as to how does a person with bipolar disorder think? They could have obsessive thoughts a lot of time. By the virtue of extreme emotional experience they think in the extreme quite frequently. Everything feels like the end of the world for them (catastrophic). They are not upset, they’re depressed. They’re not suspicious, they’re paranoid. They’re not happy, they’re elated. And of course a sea of thoughts goes along. It’s just that they cannot help the way the brain thinks, the way it leaps. The worst thing happening next is that they realize they are obsessive and then tend to obsessively worry and feel obsessively anxious! It’s not surprising that due to all these extreme, obsessive and distracting thoughts they tend to overreact to situations. It’s very tough to have a moderate response – even if it is a moderate situation. I am sure this frustrates the people around them to no end, but it goes without saying that it must be frustrating them considerably more, as they are for sure constantly trying to figure out what a “normal”, “reasonable”, “proper, “acceptable” thought process and reaction would be! Dealing with these thoughts is a full time gig and an exhausting one too! The constant worry of moderating the thoughts in order to have a healthy relationship with others can really be like being in a sinking ship. It makes you feel really bad about being depressed. You feel like it’s your fault. You feel like it’s something you have done. You feel guilty about it. Here I would say treat yourself gently with love and care. Wrap your arms around the you that is depressed. You deserve that kind of support. You don’t deserve to feel bad about being sick. It is easy to think about all the things one has lost to this debilitating condition. But it has perhaps enriched your life in some ways: you appreciate life more; probably you have learned to prioritize with your health coming first; you have accepted it and become powerful. There will be good days, bad days and bipolar days. An enthusiastic, caring educator who believes that all children can learn and grow in a learning environment that is stimulating, comforting and appropriate to children’s abilities. She has been in the education field for the past 23 years. An avid reader, she writes articles on any topic related to life, nature, spirituality, religion, art, personality development, positive thoughts and the like. Presently heading Army Asha School , a school for Special kids. Worked for the cancer patients to counsel the patients and most importantly the attendants. ← Stress: The Bane Of Modern Life.